Arizona Wildlife Views – 2016 Show 2. Featured wildlife conservation stories about saving endangered species and assisting injured golden eagles. (https://youtu.be/FVQeJ6FJFrk). 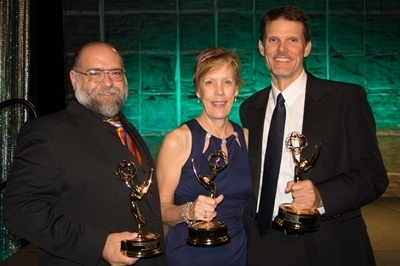 Producers Ben Avechuco, Carol Lynde, David Majure. Arizona Wildlife Views – 2016 Show 1. Featured some of the state’s most iconic wildlife, as well as efforts to conserve majestic bald eagles. (https://youtu.be/ugJJxjV2E0Q). Producers Ben Avechuco, David Majure. A Triumph for Pronghorn Antelope. See the impressive results of a 4-year project designed to save a diminishing herd of pronghorn antelope in southeastern Arizona. (https://youtu.be/Bb4pyyHzs6Y). Producer David Majure. Bats and Burned Forests. See how Arizona Game and Fish is helping Northern Arizona University researchers who are looking into the impact of the State’s largest wildfire on tree-roosting bats. (https://youtu.be/4iN3T6VPsWg). Producer David Majure. More than 900 entries were submitted for this year’s Rocky Mountain Southwest Chapter Emmy Awards by television and video production professionals in Arizona, Utah, New Mexico, Wyoming and El Centro, Calif. For more information, visit: http://rockymountainemmy.org. “Arizona Wildlife Views” is a half-hour original series produced by the Information Branch of the Arizona Game and Fish Department. The show airs on local PBS stations, city cable channels across the state and YouTube. The current 13-week season is airing at 4:30 p.m. on Sundays on Arizona PBS Channel 8. More information can about Arizona Wildlife Views Television can be found online.